SpikeIT Global Solutions, Inc. is a global Information Technology firm with unique market approach in delivering custom tailored business solutions with focus on reducing cost and at the same time not compromising on the quality. We are driven by the customer’s vision with keeping values on top. 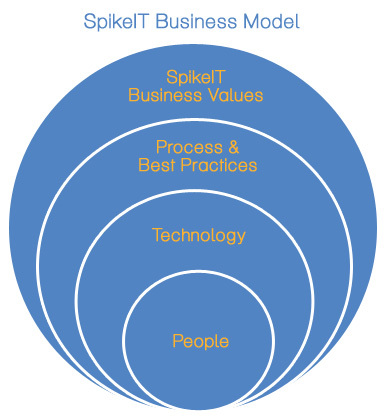 The main motto of SpikeIT business services is ‘Client First’. We are strongly motivated in offering ‘Spike in Service’ which in turn returns ‘Spike in Satisfaction’. We stand till the last minute without compromising on the quality and delivering the right solutions to the client requirements. We strongly believe in human relationships, business ethics & values with the combination of best-matched technologies & talent pool to strive to success. We are unique and special as we treat our employees as our core assets, over layered by strong technical skills following best practices & process and not compromising on the SpikeIT driven business values. Our dedicated, motivated staff always makes a difference in executing any project to a successful state with in the timelines. Client First: We always keep the ‘Client requirements’ on top and make sure we deliver to their best satisfaction by following industry best practices with better saving cost features. We take our business serious and keeping the mind set of ‘Client First’ always. We attach a client partner and delivery manager for every client to keep in sync with client expectations and bridge any gaps at a fast pace. People – Core Assets: We believe in our employees and we work with them in every step of their career in providing professional development, immigration assistance, medical help, Tuition fee, Training and career coaching. We strongly believe having a good employee relationship keeps the employer empowered with energy to deliver and lead in the market. Standards:We always keep updating our solution models with the industry latest best practices and train our employees time to time to keep in sync with the latest technologies. We never compromise on standards and offering highest quality services. Shoring-A blended Approach:We always work towards providing best cost saving model to the clients without compromising on quality using our unique blend of ‘Onsite Near Shore-Offshore’ model. We always present choice of business solutions showing the cost benefits with various combinations of our onsite and virtual team structure and work with client based on their choice.